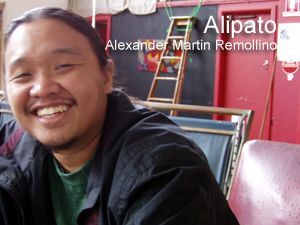 Alex was Tinig.com associate editor and columnist since 2002, among others. Alexander Martin Remollino, activist writer and poet, passed away Friday night (Sept. 3) at the Philippine General Hospital after a courageous fight against pneumonia and a lung infection. His colleague at Bayan, Renato M. Reyes Jr., announced his passing over at Twitter and Facebook. Alex left behind his mother Maria Carpio, brother Aris Remollino and fiancee Rebecca Lawson. On his Facebook page, Alex, who turned 33 last August 6, described himself simply as “a writer and development worker in the Philippines”. Alex was a well-known and respected poet in both English and Filipino. He was one of the principal leaders and co-founders of poets and writers’ group Kilometer64. In fact, his KM64 colleagues, friends and admirers were holding a benefit event in his honor when Alex passed away. It was supposed to be a night of celebration as participants recited and performed his poems. One of his poems, “Tuparin Natin ang Banta ng Ating Panahon,” was set to music and used in a music video produced by ARREST Gloria. The video won second prize in the 18 th Gawad CCP para sa Alternatibong Pelikula at Video. His poetry were published on Arkibong Bayan, frictionmagazine.com, Poets Against the War and the multimedia anthology Slam the Body Politik, and in KM64 chapbooks, among others. A journalist, he was a staffwriter for online newsmagazine Bulatlat.com from 2003-2010, and associate editor for Tinig.com from 2002 until his passing. He was a member of the National Union of Journalists of the Philippines. Together with colleagues at Tinig.com, Alex co-founded in 2003 the internet-based community Filipino Youth for Peace, which opposed the US war of terror. In 2004, he was among the co-founders of the Independent Media Center (Indymedia) Quezon City. After the presidential elections widely viewed as having been stolen by President Arroyo, he co-authored the book “Subverting the People’s Will: the May 10, 2004 Elections” which was published by the Center for People Empowerment and Governance. His published works – either news features, essays or poems – reflected fealty to the causes and concerns of the marginalized and underrepresented. It was thus no surprise that he joined the Bagong Alyansang Makabayan as public information staff and researcher early this year. Alex studied Legal Management at the University of Santo Tomas but abruptly stopped due to financial constraints. A recital of the facts of Alex’s shortened life is not enough to articulate how he is/was loved by fellow writers and poets, journalists, activists and the people’s organizations he served. As of posting time, scores have posted tributes on his Facebook page and thousands are expected to give him tribute at his wake and funeral. Many are shocked and deeply saddened by his sudden passing. We lost a good friend, a fellow writer/poet and a reliable chronicler of the big and small things we do to bring change to the country. Kaka-launch lang ng librong Ipu-ipo sa Piging, antolohiya ng mga tula ng 32 makata, sa magkakaibang henerasyon ng Panitikang Pilipino, nuong 23 Agosto, Lunes. Naruon si Alex, bilang isa sa 32 makata na nagambag ng kanilang tula. nakangiti pa siyang pumipirma, habang panaka-nakang tumatagay ng serbesa. Haay. Alex, nakapagkit ang memorya mo sa aming mga nakasama mo sa KM64… dagdag itong giya na magpapatalas ng talim ng aming mga panitik. Salamat sa buhay Alex, salamat sa iniaalay na buhay.